This was one of the most fun projects I have ever done and so I consequently made three! In fact, when I say 'I', I really mean my children, because they were so impressed that they wanted to do it! I bought this long canvas from The Works for £1.99, and using a pack of crayons that I had in the back of a draw set about creating some art! Firstly I laid all the colours out across the top of the canvas to make sure I had enough. I wanted the colours to blend into each other, so I worked through the colours of the rainbow: Red, Orange, Yellow, Green, Blue, Indigo and Violet. Whilst I am pleased with how mine has turned out, with subsequent canvas's I didn't keep the colours in this order (see below) and the effect is just as dramatic. 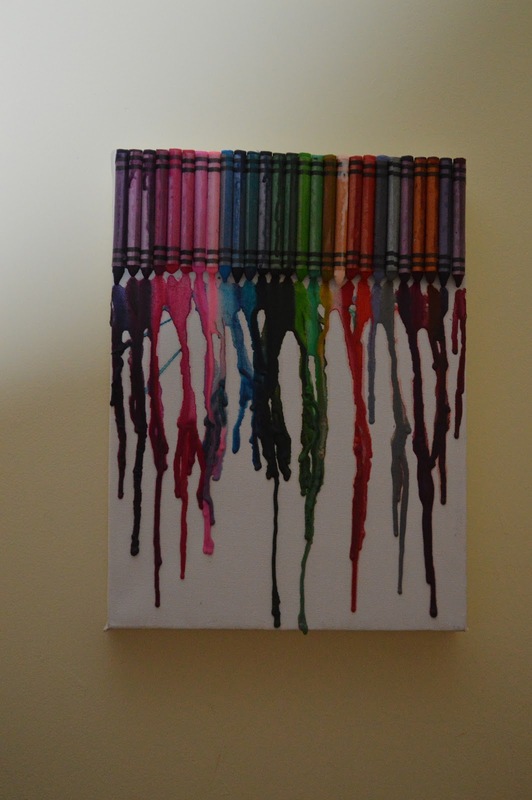 Once I had ordered the crayons I glued them onto the edge of the canvas with a glue gun. The children helped me with every other part of this project, but due to the heat of the gun I insisted on doing this part. 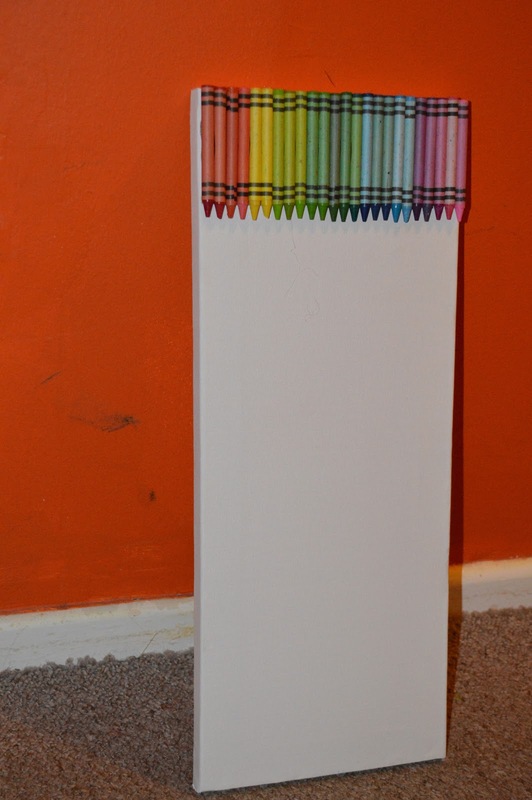 You can see here that I am gluing along the edge of the crayon rather than gluing the canvas. Now we are ready for the fun part. I covered the floor (and the walls need covering too), and let the children loose with my hairdryer. 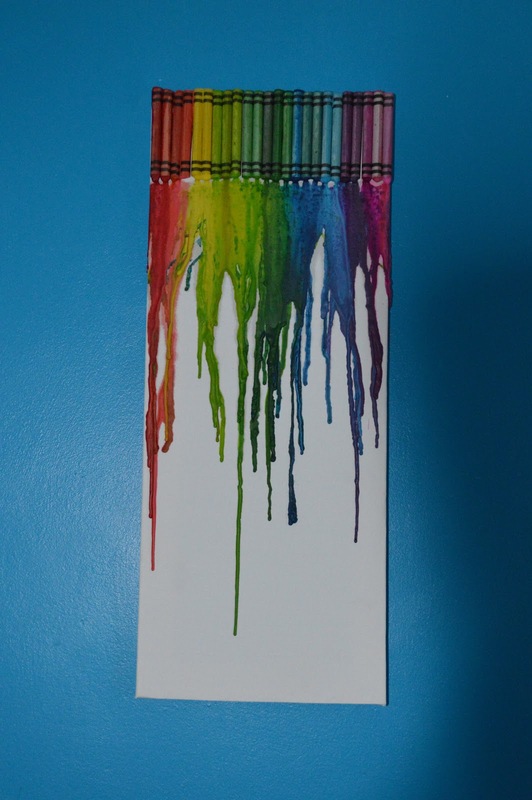 It was set on a hot, but slow speed, and after 30 seconds of the heat being applied to the crayons they begin to melt. 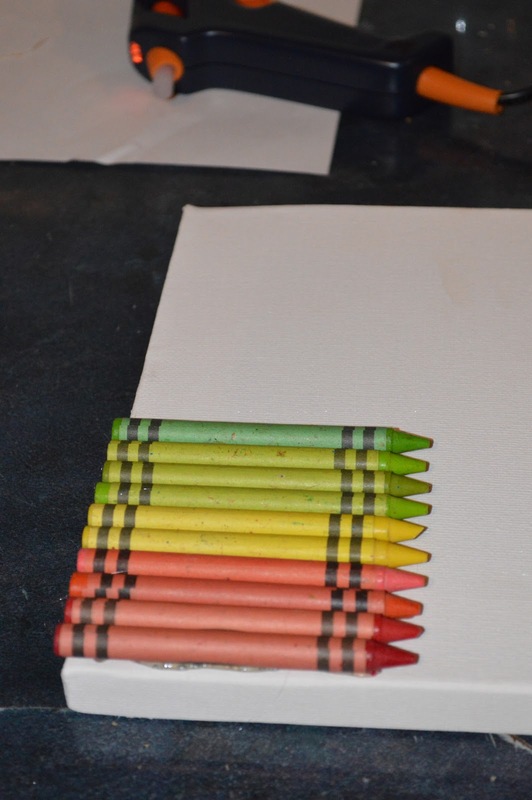 I encouraged the children to concentrate on one area of crayons at a time. 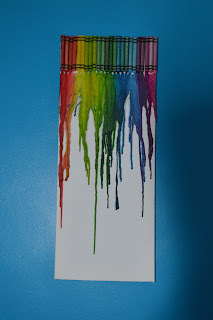 You can do this on a short canvas or a long one, and in order to make the crayons drip further you just keep the heat on longer. Once you want the drips to stop you simply remove the heat from the crayons. I do have to warn you that they can splatter onto the surrounding area and so it is important that you cover the area. I used a bin liner. 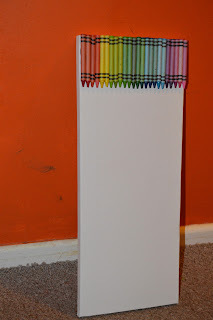 This was one of the most fun projects I have ever done with the children. It completely grasped their imaginations and they had so much fun 'melting' things.